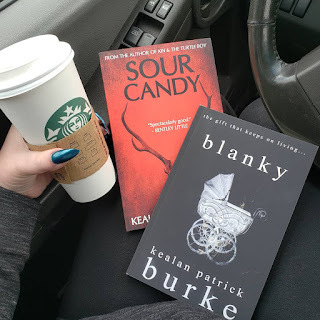 Jessica and I's first love is HORROR and KPB happens to be, in my humble opinion, the KING of the horror novella. Sour Candy and Blanky are proof why. 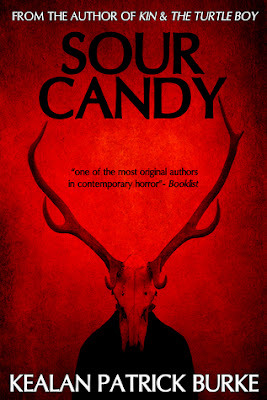 We both loved these deliciously creepy stories - continue below to see why and then go get your own copies. At first glance, Phil Pendleton and his son Adam are just an ordinary father and son, no different from any other. They take walks in the park together, visit county fairs, museums, and zoos, and eat together overlooking the lake. Some might say the father is a little too accommodating given the lack of discipline when the child loses his temper in public. Some might say he spoils his son by allowing him to set his own bedtimes and eat candy whenever he wants. Some might say that such leniency is starting to take its toll on the father, given how his health has declined. After reading Kin, I knew I needed more Burke. So I immediately purchased just about everything he wrote. Jack & Jill blew me away and I'm typically not huge on novellas and short stories. Burke manages to pack SO much into 67 pages and it's mind blowing. Right from the beginning, there's a sense of dread and it just increases page after page. This book certainly deters me even further from children, Walmart and sour candy. There's really not much creepier to me than children - I don't know what it is but **shiver**. The word "Daddy" certainly takes such an ominous tone in this read. I couldn't imagine having my life completely put upside down that I begin to question my own sanity. Just to have it flip flopped on me again... and AGAIN! He certainly brought in an element that I was NOT expecting and that was a nice surprise. Seems he can do no wrong in his novella writing and I'm eager to devour the rest of his work. Burke has managed to spark my love for the novella again. Remember folks, don't take candy from strangers... and NEVER EVER take them from children. Grief works in mysterious ways. Anyone who has lost someone deals with the sadness and emptiness left in their own way. No way is more right than another. Time actually does not heal all wounds and that gaping hole left by the person who is no longer with us feels endless. 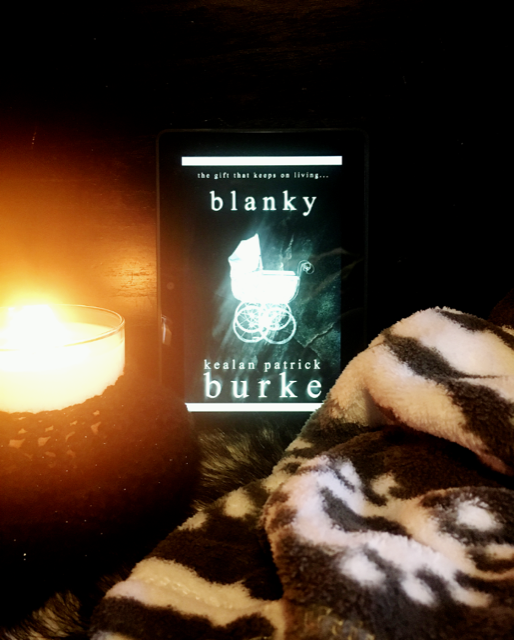 The author takes us on Steve's journey after the death of his 11 month old daughter and that damn Blanky she seemed to adore. Why does this keep showing up? They DID bury her with it, right? This is one of those novellas that leaves you wondering what actually happened within the story. Whose perspective is correct and just how far would your grief take you - or are you the sole cause of your own grief and you can NEVER EVER run away from THAT? I love that this is set in Ohio and Burke's referencing the true nature of an OSU Buckeyes fan! Little details like this are ones that really get to me sometimes. So thank you, Kealan, for that since I lived in Ohio for 16 years and TOTALLY get it. 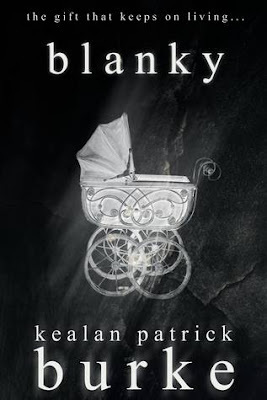 After reading KIN by Kealan Patrick Burke I couldn't wait to pick up more of his work. I started with his novella, BLANKY. I'm amazed that he could turn such an ordinary and unsuspecting item into some terrifying. With the novel being just under 80 pages, I don't want to give away too much information on it. We follow a husband and father that has endured every parents' worst nightmare - losing their infant child in the middle of the night. Events begin to spiral as the missing baby blanky reappears, what really happened that night? If you like novellas and horror found in everyday situations or items, then this is a perfect one to fly through! I give this 4/5 stars. 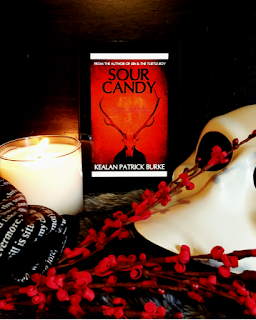 Immediately after finishing BLANKY, I continued with SOUR CANDY by Kealan Patrick Burke. This one I liked a little more simply because of the uniqueness of the plot. 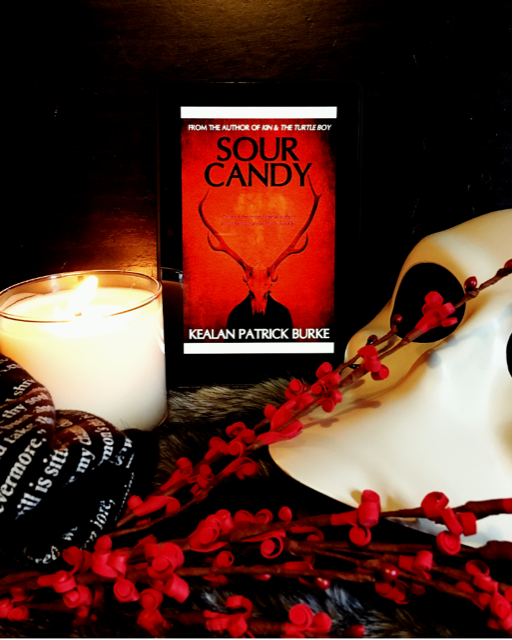 A mysterious child, sour candies, and a man withering away. What hold does this child have on him? Is he a menace or a protector? This was another story that was just under 80 pages and I think you need to go into it with as little info as you can. Keeps the suspense and eeriness up! Another quick horror story that you'll flip through in less than an hour.